Broncos development players Tanah Boyd and Ethan Bullemor went head to head in Round 3 as Souths Logan took on Norths at Davies Park. Bullemor grabbed the bragging rights, coming off the bench to score a try in the Devils 26-point victory. Centre Sebastian Kris was a try scorer in Mounties 16-point win over the Jets at Shark Park. A member of the Raiders top 30, Kris broke 5 tackles and ran for 94 metres. Development players Tui Katoa and James Roumanos featured in Canterbury’s loss to Wentworthville, with Katoa scoring a second half try. Roumanos came off the bench, making 17 tackles without a miss in 35 minutes. 18-year old centre Bronson Xerri was involved in everything in Newtown’s loss to Mounties. He assisted two tries, scored one himself and broke nine tackles. Development player Braydon Trindall, originally named on the bench, started at five-eighth. Titans top 30 member Treymain Spry only lasted 31 minutes in Tweed’s game against rivals Burleigh, before leaving the field with a head knock. Winger Ioane Seiuli ran for 87 metres and broke five tackles in the 28-point loss. Five-eighth Luke Metcalf came off injured after 10 minutes in Blacktown’s 20-point loss to North Sydney. Jersey Flegg captain Tyran Ott made his Canterbury Cup debut, playing 80 minutes and making a massive 54 tackles with just three misses. Centre Alfred Smalley ran for 139 metres and broke six tackles. Three of Melbourne’s development players featured in the Intrust Super Cup in Round 3, with Kelma Tuilagi playing 29 minutes in Easts win over Ipswich, while Cooper Johns and Kayleb Milne featured in the Sunshine Coast’s two-point over the PNG Hunters. Fullback Tex Hoy continued his great Canterbury Cup form with a try, 153 running metres and four tackle breaks in his side’s loss to Penrith. Halfback Phoenix Crossland made 18 tackles and kicked for 396 metres, forcing a drop out. Cowboys teenage forwards Tom Gilbert and Peter Hola impressed again when they faced off in Round 3. Gilbert scored a try and ran for 206 metres in Townsville’s win, with Hola running for 141. Logan Bayliss-Brow had a 25 minute stint off the bench in Mackay’s win over the Capras, running for 69 metres. 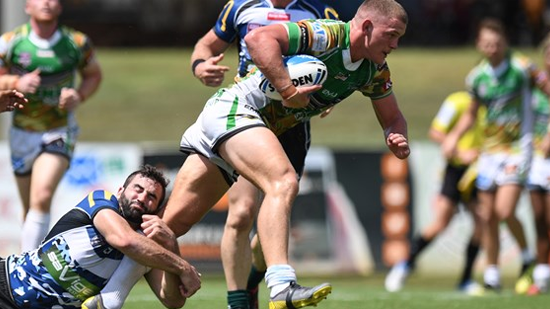 Wentworthville held on for a two-point victory over Canterbury, with centre Ethan Parry running for 75 metres and making 12 tackles without a miss. Mawene Hiroti ran for 100 metres and kicked four goals in South Sydney’s last minute win over St George Illawarra. Prop Ky Rodwell added 81 metres off the bench and made 21 tackles without a miss. Zac Lomax kicked four goals and ran for 119 metres in the Dragons four-point loss to the Rabbitohs. Development player Steve Marsters partnered him in the centres, running for 51 metres. The Roosters had five under-20s players in the Bears’ 20-point over Blacktown. Winger Asu Kepaoa scored a try and ran for monster 197 metres. Second rower Josh Curran played 80 minutes, making 23 tackles. Sam Verrills, Fletcher Baker and Edenn Rogers-Smith all came off the bench, with Verrills making 25 tackles in 48 minutes and Baker running for 107 metres and making 41 tackles in 54 minutes. The Warriors suffered a tough 38-point loss to the Magpies in Round 2, their side featuring four under-20s players. Hayze Perham and Chanel Harris-Tavita started in the halves, with Harris-Tavita kicking for 239 metres. Prop Tom Ale played 57 minutes and made 29 tackles with a single miss, while Phillip Makatoa came off the bench and made 25 tackles. Tigers top 30 squad member Dylan Smith enjoyed a solid day out in the Western Suburbs big win over the Warriors. The 19-year old ran for 110 metres, setting up a try and two line breaks.